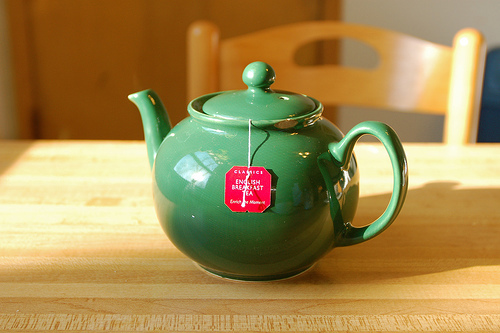 English Breakfast tea is extremely popular. Nearly every company that sells tea has a version of this common black tea blend. The exact blend of English Breakfast varies by brand but includes some combination of teas from China (Keemun or Yunnan), India (Assam), Sri Lanka (Ceylon), or Kenya. The British have enjoyed black tea since the 1600s, first importing tea from China and later India. Blends that are more traditional to the origins of tea in Britain use Chinese teas as a base while other blends favor teas from India or Sri Lanka. These words describe English Breakfast tea. Some sources claim that a man in Scotland was the first to market his blend of "breakfast tea" and the terminology caught on with the London crowd who added the word "English." At the time, tea in England was an upper class drink and one served in the afternoon. Others credit an American tea merchant, who created and sold a blend of Chinese teas in the 1840s. Whatever the exact origin of the term "English Breakfast," it seems a fitting name. The English are known for having a preference for strong robust teas that hold up to the addition of milk and sugar. As the name implies and also because of its strength, English Breakfast is a blend associated with starting your day. However, there is no reason you can't enjoy this tea at any time!